uuid : e98142b7-0189-4e38-85a9-a56958ea24e3 templates_id: 119521 templates_uuid: "e87d313e-ee66-4efc-aa13-4f833dc0a2e5" title: "Bill of sale - Bill of sale template with sample" display_name: "Bill of sale" meta_keywords: "Sale of goods agreement" description: "
A bill of sale records the sale of personal goods (such as aircrafts, a boat, horses, pets, furniture, mobile phones or any other personal goods, eg bicycles, appliances) between you and a buyer. Anyone selling or buying a personal item without a warranty or guarantee can use this bill of sale. A bill of sale records the transfer of your goods to another person. The bill of sale expressly states that the goods are \"sold as seen\" so there can be no argument over the condition of the property in the future. It also states the purchase price and a description of the items. A bill of sale - or sales receipt - is a written record of a transaction between a seller and a buyer, which transfers ownership of an item from one party to another. It includes important information about the purchase such as the names of the buyer and seller, a description of the item, item price and form of payment. Whether you are a seller or a buyer, a bill of sale is a very useful document as it keeps a written record of the transaction and provides proof of the purchase. You can use a bill of sale for any personal goods that you wish to sell. When shouldn\302\222t you use a bill of sale? What is a \302\221sold-as-seen\302\222 agreement? 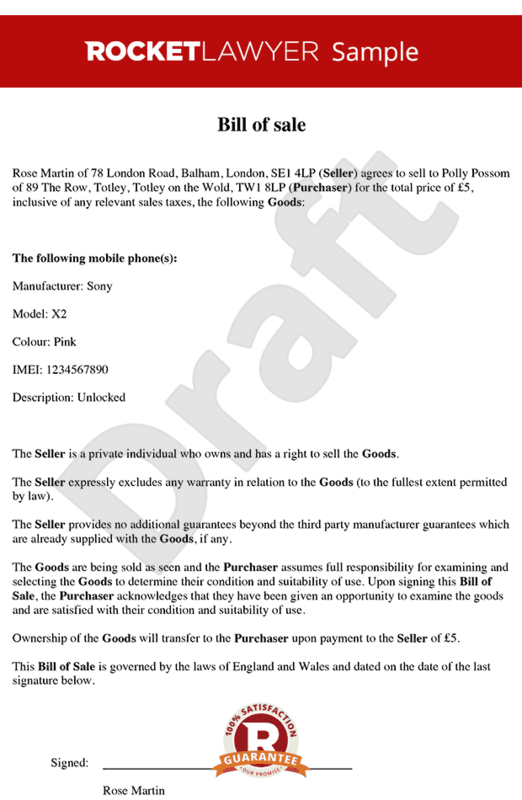 Indicating in a bill of sale that the item is \'sold as seen\' ensures that the seller is not liable for any flaws or damages related to the product. It protects the seller from any liability after purchase, for example if the item does not work properly. What are the seller\302\222s obligations under this agreement? In the bill of sale, the seller confirms that they will provide the buyer with the item in accordance with the terms of sale. What are the buyer\302\222s obligations under this agreement? The buyer agrees to pay the set price on the agreed date, and acknowledges that the item is \'sold as seen\', without any warranty from the seller. This bill of sale is governed by the law of England and Wales.
" created_timestamp: "2018-10-08 04:36:38.0" modified_timestamp: "2018-10-08 04:36:38.0" active: true created_by: 246 modified_by: 246 dcm_id: 338 url_slug: "Bill-of-sale" meta_description: "Use this bill of sale template when transferring ownership of an item from seller to buyer. Let Rocket Lawyer guide you through this process." A bill of sale records the sale of personal goods (such as aircrafts, a boat, horses, pets, furniture, mobile phones or any other personal goods, eg bicycles, appliances) between you and a buyer. Anyone selling or buying a personal item without a warranty or guarantee can use this bill of sale. A bill of sale records the transfer of your goods to another person. The bill of sale expressly states that the goods are "sold as seen" so there can be no argument over the condition of the property in the future. It also states the purchase price and a description of the items. When shouldnt you use a bill of sale? What is a sold-as-seen agreement? Indicating in a bill of sale that the item is 'sold as seen' ensures that the seller is not liable for any flaws or damages related to the product. It protects the seller from any liability after purchase, for example if the item does not work properly. What are the sellers obligations under this agreement? What are the buyers obligations under this agreement? The buyer agrees to pay the set price on the agreed date, and acknowledges that the item is 'sold as seen', without any warranty from the seller. More than just a Bill of sale template, our step-by-step interview and guidance makes it easy to create your document. Easily create online, download, print and sign your free Bill of sale in minutes. This document is also sometimes called: Sale of goods agreement.